Though the historical record is somewhat spotty, Tretower is thought to occupy an important place in the Agincourt story. 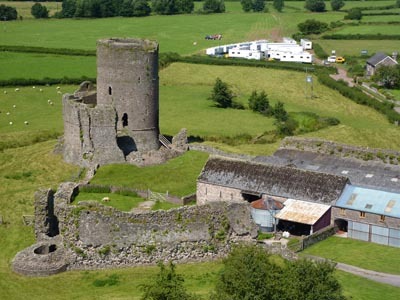 Due to the destruction of the castle at nearby Crickhowell during the Welsh uprising under Owain Glyndŵr, Tretower Castle is likely to have been the muster point for the local contingents who responded to Henry V’s call to arms in 1415. Tretower, an unusual ‘two-in-one’ historic site spanning many centuries, incorporates the castle and later manor house, a building rare in Wales. Though little remains of the former, Tretower Court is a gem. It demonstrates the shift in architectural priorities from the 15th century onwards as the threat of conflict declined and fortified castles gave way to comfortable manor houses. It was a house was built to impress, reflecting the high status of the influential Vaughan family. Sir Roger Vaughan married Gwladys ferch, daughter of Dafydd Gam. Both men did not survive Agincourt where, according to legend, they were knighted on the battlefield before they died. A suite of rooms has been recreated as they may have been in 1470 when the Vaughans were movers and shakers in the high society of the times. The wall hanging in the Great Hall depicts scenes from Agincourt. To mark the 600th anniversary of the Battle, Tretower will be recreating this historic event with its very own medieval encampment. Visitors will be able to sample what life was like for a common soldier on his way to war, as well as seeing demonstrations of traditional crafts that would have been part of the war effort. You will even be able to emulate the Welsh archers by having a go with a bow, or watch the professionals take part in a sharp-shooting archery tournament. For further information, please check our Events page. Find out more about Tretower Court and Castle on the Cadw website.